We have created this page for travelers to find current information regarding health, travel safety, and infrastructure upgrades in Sayulita. 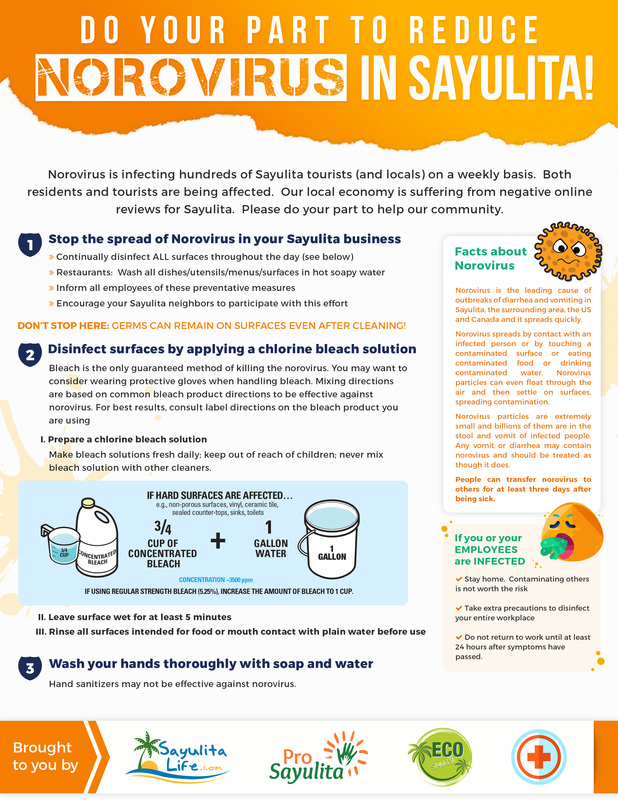 We understand there is a lot of concern over the "Sayulita sickness" and norovirus and rotavirus in Sayulita. There are a significant number of people, especially groups, who have fallen ill while on vacation. It is important to note there has been no source found for the illness, there is no doctor diagnosed correlation with swimming and viral illness. The following information has been gathered from multiple sources and we hope it will help visitors to stay informed, enjoy their vacation and avoid getting sick. On April 11, 2019, the new emissor pipe was successfully installed and the newly upgraed wastewater treatment plant is online and everything is functioning. The Governor of Nararit, the President of Bahia de Banderas, and the Director of the CEA (Nayarit's potable water authority) toured the plant and inaugurated the new facility. The treatment capacity has greatly improved and the latest water quality tests performed by the Nayarit (state) government already show vast improvement. 10-20 PPM / 100 ML. 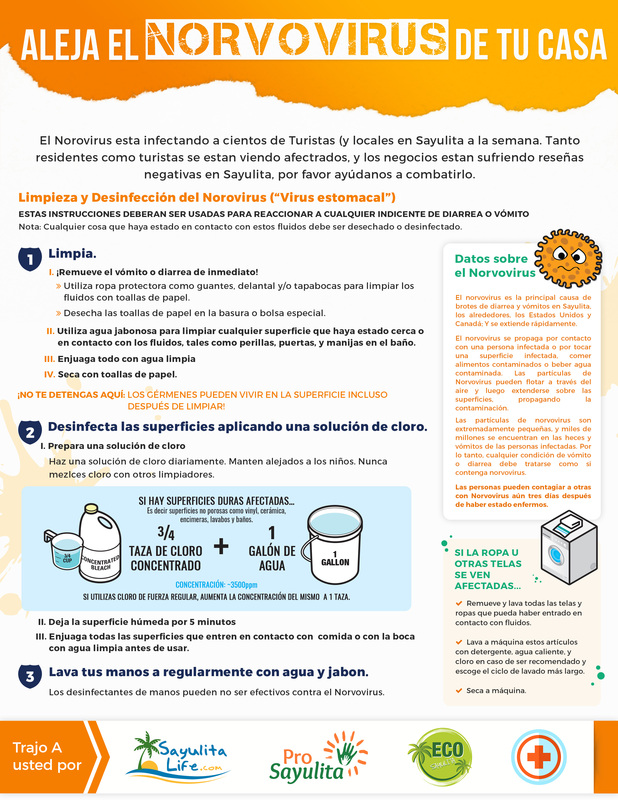 You can read about the water quality in this article from the Health Secretary of Nayarit (en Español - Google Translate works well to get an English version). Get the complete story on all the updates in English from this El Sayulero article from April 17, 2019. Local volunteers are already making plans to plant native bushes and trees to help bring back the natural estuary of the seasonal Sayulita river. 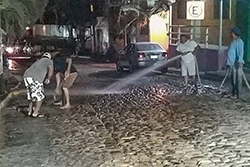 As of March 23, 2019, in the continued efforts to prevent the spread of illness in Sayulita, ProSayulita is power washing the streets with chlorinated water. Please donate if you are able. This project is privatly funded and its success depends on suppport from the community. Each winter we see an influx of norovirus cases, typically between the months of November and April. This coincides with flu and virus season in the US, Canada and other parts of the world. 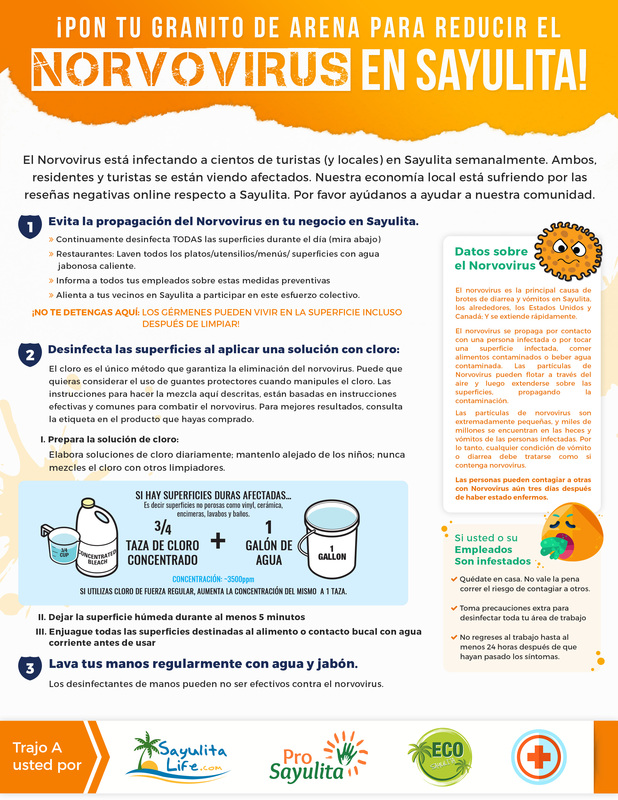 Norovirus is not a Sayulita specific illness, you can get it anywhere, in schools, day care and elder care facilities, cruise ships, etc, The CDC (Centers for Disease Control) reports on average, 20 million Americans contract norovirus each year. There is a lot of speculation, but nobody knows why norovirus is occurring in the winter months and does not seem to be an issue in the summer even though summer tourism is at an all time high. Norovirus (also called the stomach vomiting bug) is highly contagious and is often misdiagnosed as food poisoning. In addition to person to person spread, it can survive on hard surfaces for weeks and up to twelve days on contaminated fabrics. 61% of cases are transmitted by touching an infected surface. It can be resistant to hand sanitizer. People can still be contagious and spread norovirus for up to three days after symptoms subside, and in some cases up to two weeks. See this fact sheet from LA County. Please note that this is a virus, and there is no treatment other than rest and fluids. Antibiotics cannot "cure" norovirus. Note: If you are sick for 24-72 hours it is likely norovirus. If your symptoms last more than a week or two, it is not likely noro and you should see a doctor as you may have a bacterial infection as opposed to a virus. The entire town has been on board with trying to raise awareness and to prevent the spread of illness. 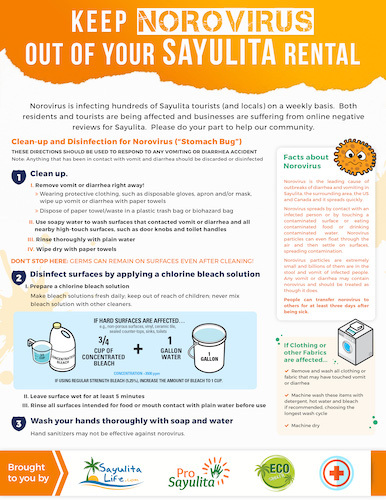 Laminated flyers were created and available at no charge for every Sayulita business or vacation rental to post for their cleaning staff, with instructions how to clean with a bleach solution in order to kill norovirus and other seasonal germs. Update on Rotavirus in Sayulita. There have been a small number of doctor diagnosed cases of Rotavirus in Sayulita. Rotavirus is most common in infants and children, although adults can also get sick, they usually have milder symptoms. There is an immunization available for children for Rotavirus. Please visit this page from the CDC (Centers for disease control for more information. As with norovirus, preveniting rotavirus starts with frequent hand washing with soap and water. As with norovirus, there is no treatment for rotavirus, antibiotics do not help with viral infections. Rest, fluids, and see a doctor if symptoms of severe deyhydration are present. Wash hands very frequently with soap and water each time you use the bathroom, after every diaper change, before eating and preparing food, and immediately upon returning to your rental after being out and about, touching things in town. Please do not rely on hand sanitizer. Norovirus can be resistant to hand sanitizer; soap and water is best. Soak fruits and vegetables in Microdyn (available at all of the local stores) before eating, thoroughly cook all shellfish. Freezing does not kill the virus, it must be cooked to 140 degrees Fahrenheit 60 degrees Celsius. Isolate the sick person, even when feeling better, people can still be contagious and should not prepare food for others. Notify the property manager or housekeeping staff if you need new linens, there are several laundry services in town for washing personal clothing if your rental does not have a washer and dryer for guest use. If someone in your party falls ill, please notify the property manager or homeowner so they can alert the housekeeping staff to take extra precautions when cleaning. 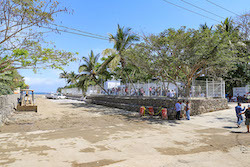 The exponential growth in tourism was too much for Sayulita's delicate and out of date infrastructure. The entire town is excited to view the progress that is happening and the project is almost complete. The Mexican government tests the water in the bay quarterly and publishes the results. Please note the parts per million of contaminants allowed may differ than that in your home country. In Mexico, the water is deemed safe for swimming if the PPM is under 200. None of the water quality tests have gone over this number. The government website is of course, in Spanish, and can be a bit difficult to navigate, but past test results can be found here. Phase one began in October, 2017 and replaced the main sewer line beneath the street all the way to the treatment plant. The sewer line was buried and encased in concrete at the seasonal river crossing. Phase two followed which upgraded and completely overhauled the wastewater treatment plant and doubled the capacity. Phase three is in progress and is scheduled to be completed before May, 2019, dependent upon ocean wave conditions. The current phase includes the installation of an emissor pipe that will carry the treated wastewater (NOT raw sewage) 2.3 km into the deep ocean water. Environmental impact studies were completed before the project began and this was found to be the best solution. Coastal cities around the world deal with treated wastewater using this method. Once the emissor pipe is installed, local volunteers are going to replant native plants and the natural estuary will return along with all the birds and wildlife that use the area. 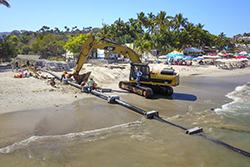 You can read about the entire project and all the phases in this El Sayulero article from March, 2019. The US and Canadian governments release travel warnings when there have been events that they determine deem certain areas unsafe for travel. The Puerto Vallarta airport is located in the state of Jalisco. However, please note that if you see Jalisco on a travel advisory, it is highly likely the warnings stem from activity in non-tourist areas of the state. There have been no current problems in Puerto Vallarta that affect tourists. As you leave Puerto Vallarta, soon you will cross the state line into Nayarit, where Sayulita is located. There have been no reports of violence or cartel activity and it is safe to travel from Puerto Vallarta to Sayulita by taxi, bus, and private car.